The phone rang in early April. The caller was a South Florida man who had a friend who knew about "those classic Chevy guys" in Sanford, FL. This man, John Lomonaco, had just lost his dad and was looking for someone to help him sell his dad's collection of old Chevys and parts. Real Deal Steel receives phone calls or emails like this several times a month. Normally we do not follow up on them due to price, busy schedule at work, low value on the items being offered for sale -- and foremost, it is just not what we do. These cars, however, were in upstate New York, not too far from where I grew up so I asked for more information. John said these cars had been his dad's (John V) lifelong projects -- projects that just never quite got finished. The cars? A '57 convertible, two '57 hardtops, a '68 Camaro and a few other late model cars, and a Model A. I requested pictures (you would be surprised at how often we never hear from callers or emailers again after asking for photos! ), which arrived in my inbox the next day. I could see the cars were rough (upstate New York is seldom nice to old Chevys) but fairly complete and there was a promise of "piles of parts". So the negotiations were wrapped up, travel arrangements made and off to Albany, NY, I went. When I reached the Alamo counter in Albany, all the subcompact cars were rented so I wound up with a Jeep Renegade with only six miles on it. If Alamo knew what their new SUV was going to be used for in the next few days, I am sure they would not have rented it to me! The first two cars -- the '57 convertible and the better of the two '57 hardtops -- were in the garage next to the house in downtown Oneida. Oneida is a beautiful old town made famous by silverware production that began there in 1880. Naturally, my hopes were up that one of the cars in the garage might be a real diamond, but it was not to be. Both cars in the garage were very rusty and completely covered with and surrounded by clutter. Not just car and tool clutter, but anything and everything clutter! I took about three hours to move the clutter, air up the tires and get the cars pulled out into the light. Neither of the cars had been outside in more than 40 years. John says these cars were in the same spot in the garage they had been when he was a boy. Just before leaving Florida I gave John a list of tools and equipment that I thought we would need to dig the cars out and get them rolling. Two of the items on the list were a pickup truck and 20-plus feet of chain. John was unable to secure a pickup truck but the old garage was full of chains. Enter the brand new Jeep Renegade (now with 75 miles on it)! For all of the advertising Jeep does on their vehicles being so tough and rugged, would you believe that a 2017 Renegade has NO TOW HOOKS front or rear? Sheesh. Even ricers have tow hooks. So throughout day one and two of this new Jeep's existence, chains were repeatedly wrapped around front or rear lower control arms (trying to avoid plastic body panels) with the other ends hooked to an old Chevy or Camaro. After these two cars were out, John and I made the 20-minute drive to nearby Hamilton, NY, to attempt to rescue '57 hardtop No. 2. This car looked like a slick, straight, nice black car in the pictures -- but you know how pictures go. It turns out the car was jammed up against a fence in an outside tow lot where it had been parked after being front-ended in 1989. Brian, the foreman at the tow lot was 16 when the car was parked there. Brian parked the car in this very spot the day that John Sr. wrecked it. Brian is now 41! We tried pulling it out with the Jeep but it just wouldn't budge. Brian brought in the wrecker, hooked to the Chevy and the front half of the car began to move -- but not the back half. It was apparent the frame was broken in half so getting this one out seemed futile. Another phone call to a better-equipped wrecker service got things moving once again. Andy the tow man showed up and had obviously done this before. He passed chains with large hooks underneath the car (after we spent over and hour digging under and around the car by hand) and installed binders to tie the front of the chassis to the rear axle. A few serious tugs with Andy's wrecker and out of the ground it came -- well, most of it anyway. A large section of rotted frame was left behind as the frame had rusted away just behind the firewall all the way to just in front of the rear axle! Too many harsh NY winters outside. All four wheels were locked up so this one would test us to our limits to attempt to get it rolling. Day 1 ended with John and I pulling the '68 Camaro, a car his sister had driven in high school, out from under the car-tent in the back yard. This car was in better shape than expected and all four wheels rolled freely. Day 2 began with rounding up as many parts as we could from the garage and basement to stash in the interior and trunk of each car for the long trip to sunny Florida. I borrowed Andy's oxy/acetylene torches and cut the drums off the stuck wheels. The wheels (all four on 57 hardtop No. 2 and one on 57 hardtop No. 1) were locked because the brake shoes were stuck to the brake drums. Once the drums were cut, everything rolled freely! Two of the cars (‘57 hardtop 1 and the ‘68 Camaro) can easily be restored. 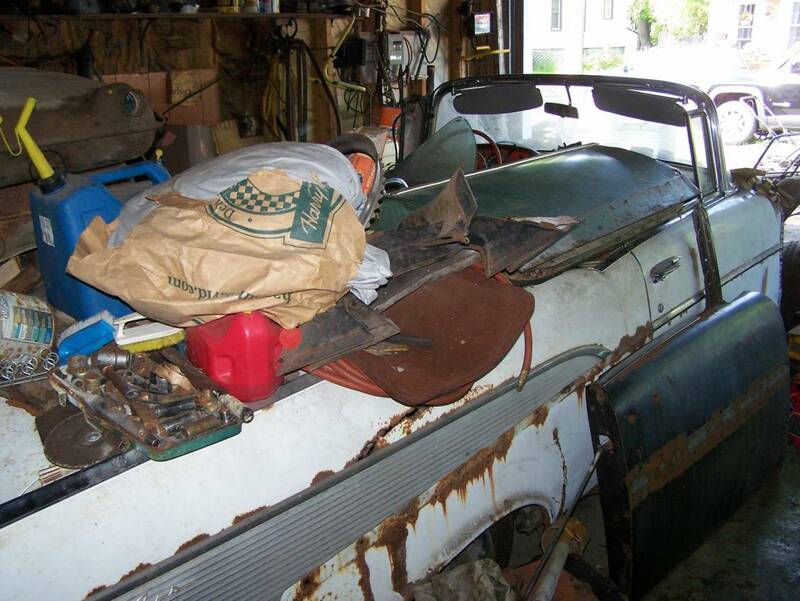 The convertible and ‘57 hardtop 2 will need to be re-bodied -- they are just too rough to restore. We'll decide the destiny of each once they are transported south. These cars were John V's passion. He loved classic cars and had a real soft spot for ‘57 Chevys. He was approached by many people over the years to sell, but the answer was always the same – “I am going to fix those cars for myself!” He just never quite got around to it. Most people think I am crazy, but this was a great way to spend the weekend. Overall, the cars were about what I expected as far as condition. The best part is that each car is very complete -- only a few minor parts have been removed from each. I made some great new friends, explored a part of the country I had not been to for years and spent three days doing what I love doing best -- playing with old Chevys! Joe Whitaker is co-founder and co-owner of Real Deal Steel in Sanford, FL.